With the sun shining, many of us will head to the seaside to soak up the rays, do some rock-pooling and eat some ice-cream, however hundreds of years ago, when the sea was predominantly an industrial location and the therapeutic nature of sea bathing unknown, pilgrims would visit the sea-side to sample its sacred springs as they would elsewhere. Such an arrangement would mean that often springs would have greater powers because the high tide would mean they were available for less time. 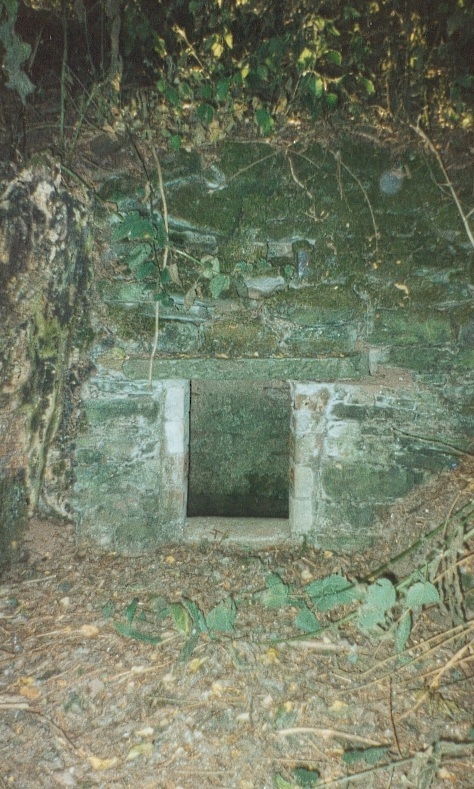 A similar spring being St. Agnes’s Well Humphrey Head (Cumbria) where at the foot of the limestone cliffs is the spring arising in a rectangular chamber. 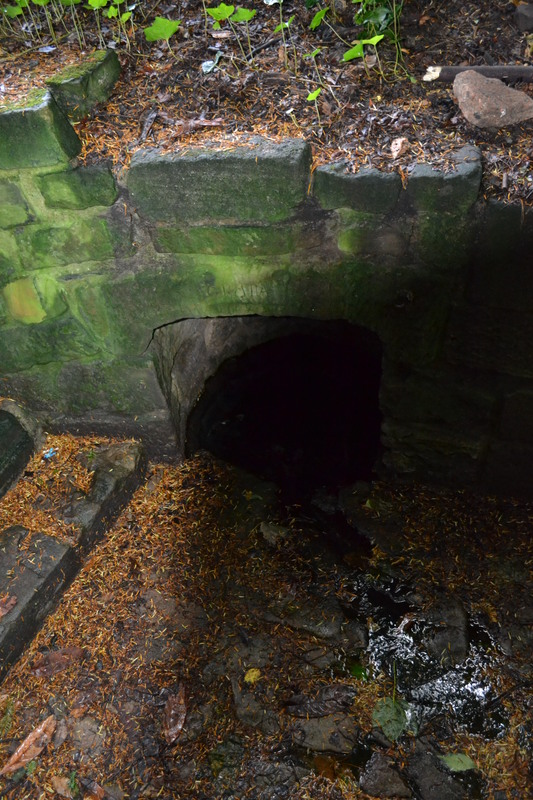 A similar well has already been discussed at St. Govan’s chapel, but sadly dry. In Wales, a location which cannot be bettered for grandeur can be found at St. Mary’s Well on the Lleyn Peninsula. Regularly covered by the tide with its salty water, the spring remains fresh at low tide. 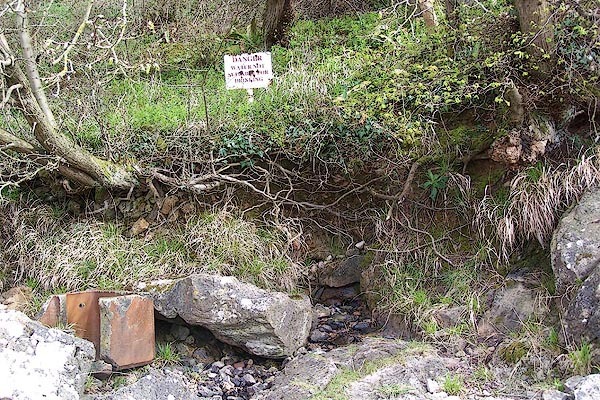 The natural spring was said to be the location pilgrims to Bardsey Island would stop. To get a cure it is said that a mouthful of water from the well would be needed as you would climb the cliff above to walk around the chapel above three times. The most famous seaside spring is the most evocative, Holy Well in a sea cave Holywell Bay near Newquay (Cornwall). Many doubtlessly pass this sea cave on the way to the sea without a second thought. Many hundreds of years ago it is said that the bay was littered with crutches as evidence of those who had been cured there. Despite no sign of any obvious Christianisation, a legend is told of its creation. It is said that the cave was one of the places that the cortège carrying the body of St. Cuthbert rested here on their way to Iona. However, that sounds like a convenient story to cover and explain attendance at this most pagan of wells. The water trickles across multicoloured natural basins of limestone, in the dim light of a torch, the pinks and blues, provide a remarkable view of a peaceful refuge. Then in 2010 they were re-discovered, repaired and rededicated and cures are now reported…goes to show that some seafronts can provide all aspects, so if you are off with bucket and spade consider there may be a sacred spring somewhere to give a quench to the spirit and thirst perhaps. 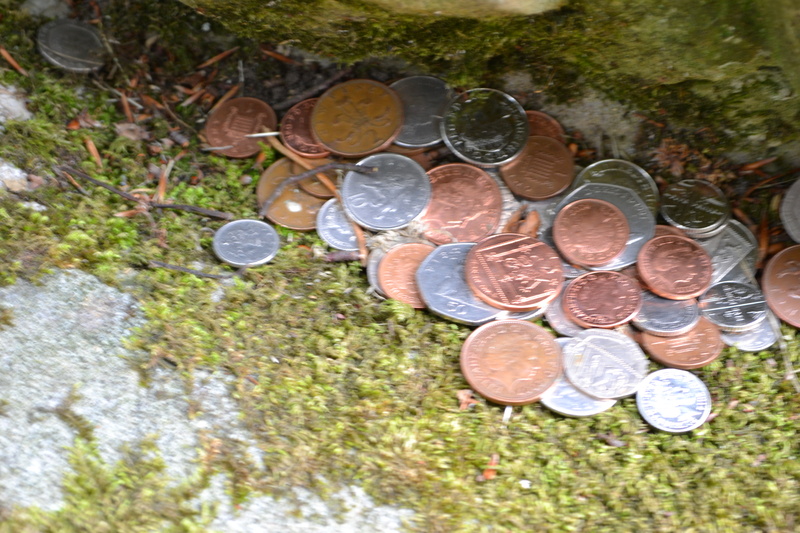 To those reading this blog, who may not be overly familiar with the study of Holy wells and healing springs, may be familiar with the throwing of coins into springs. However, this is a relatively recent invention, before this activity, itself of course quite expensive in older times – pins were used. Madron Well © Copyright Malcolm Kewn and licensed for reuse under this Creative Commons Licence. Pins you may ask? Why would you have a pin on you? Well of course in those days pins were commonly used, especially by women to hold hats on and so were generally available. A glance through works such as Jones on Holy Wells of Wales and Hope’s Legendary Lore of Holy Wells produces quite a number. Despite this rather imaginative reason for dropping pins, why were pins dropped. Well in many cases, when the pin was bent, this action resembled that done in prehistoric times to swords deposited in ritual areas as votive objects. For example it may be significant that at some wells pricking the finger before casting it away may have had a deeper meaning. Does it represent a sacrificial aspect to giving a votive offering? So perhaps take a small pin box and caste a pin not a coin if you must. 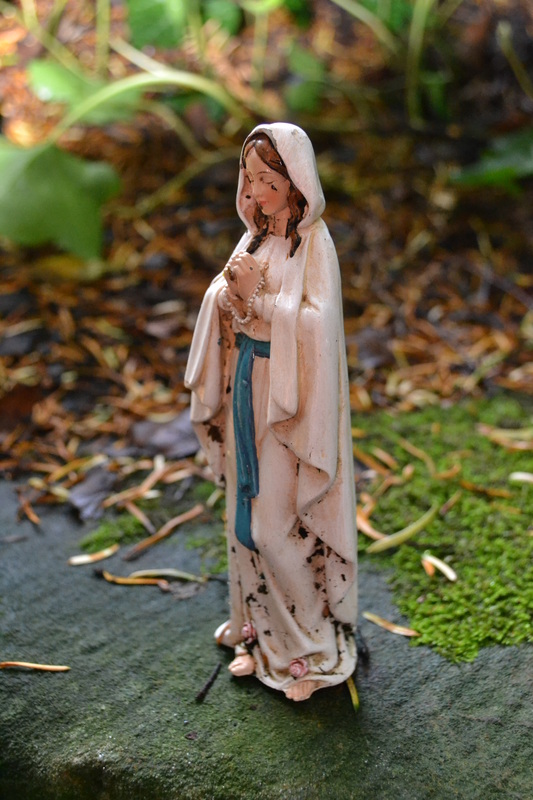 Every month this year I am covering the veneration of water in a different item, 12 in all. This month it will be the clootie or rag. As the title suggests. Many years ago when my interest in the subject was first piqued I visited the famous Madron Well. To be honest I was not very impressed with the well; a square concreted hole in the ground, if I remember devoid of any atmosphere. No what impressed me was what was attached to the trees; hundred and thousands of bits of cloth. I had no idea why they were there but clearly there was significance to them. Soon after I purchased the Bord’s influential Sacred Waters and all was explained. Basically, the custom would involve the piece of rag, traditionally although rarely now, a piece of clothing, being dipped upon the well’s water rubbed on the afflicted area and then hung on the tree. As this cloth rooted, so it was thought the ailment would disappear. A word on nomenclature the word clootie commonly used for the rags is a recent spread it is originally limited to Scotland. As far as I am aware no countrywide study has been made of the distribution of the custom, but it appears largely to divided into two blocks in the British Isles. From my research, I have found no evidence of the custom in the south –east. It is traditionally absent from all the counties south of the Thames i.e Kent, Sussex, Surrey and Hampshire. Similarly there appears no record in the home countries of Berkshire, Buckinghamshire, Bedfordshire or Hertfordshire, although only two of these counties have been fully studied. As we travel westward it is encountered in Somerset with Compton Martin’s Rag Well and Cornwall as well as parts of Wales, although Devon is lacking any evidence and that for Dorset appears modern (see below). “Holy Well, on the east side of the parish, is in repute for medicinal virtues, among the vulgar, who, after using it, tie rags on the surrounding bushes, to propitiate the genius of the spring”. 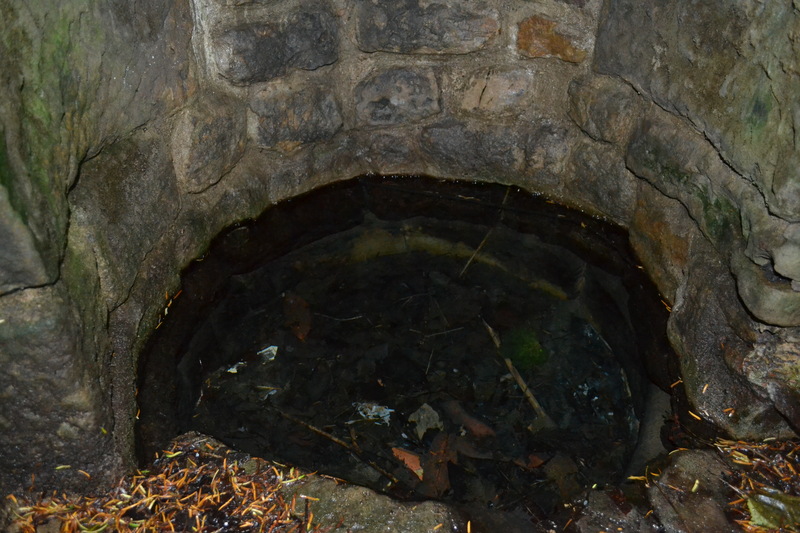 Of the traditional pre-20th century sites none continue the tradition and ironically another, probably non-holy well, the Ludwell has become the focus of a modern rag leaving tradition. Interestingly, it is recorded in Nottingham, but absent from the rest of the county. Do is there any record in Derbyshire, Leicestershire or Staffordshire. “they teare of a ragge of the shirte, and hange yt on the bryers thereabouts”. “twenty years ago the Rev E. Peacopp, curate of Healaugh, informed me that shreds of linen were to be seen attached to the bushes which overhang this well”. “St Helen’s or the Wishing Well, which is often visited by young men and maidens… In a clump of trees near the river, hanging on the roots of the trees, are some scores of gewgaws left by anxious lovers, who suppose the well holds some subtle efficacy or charm”. “when the well was open it was near the hedge on which used to be hung bits of rag with which people had washed. These were left hanging under the delusive idea that as the rags wasted away so would the part affected, which had been washed, therewith proceed to mend and become sound”. In Durham Jarrow’s Bede Well and in Northumberland the Lady Well, Cheswick were both rag wells. However, Scotland has three of the most famous rag or cloottie wells. The most famed is that which despite the given name of St. Curidan is better known as the Clouttie well and is the one which has attracted the greatest controversy. 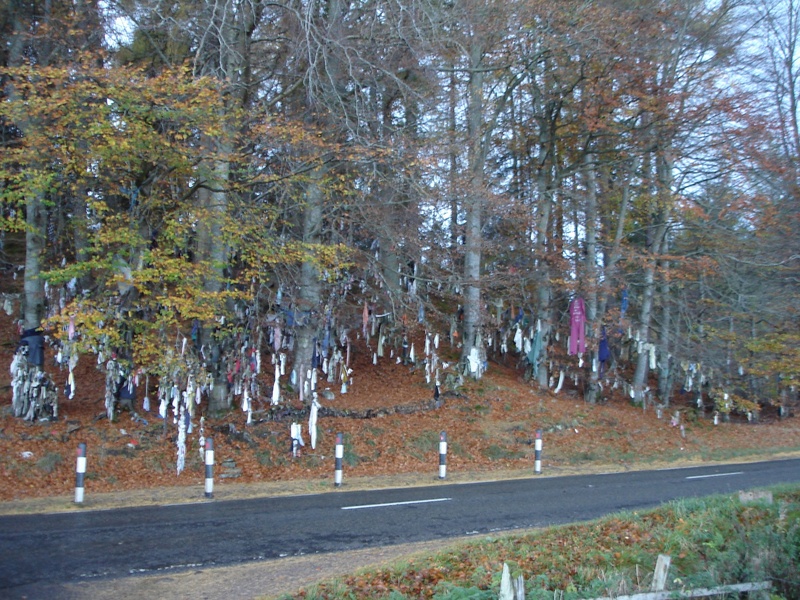 Found in Munlochy on the A832, here rags festoon every mm of the surrounding trees and became so unsightly that the decision was taken to remove many of them and surf the bad luck! 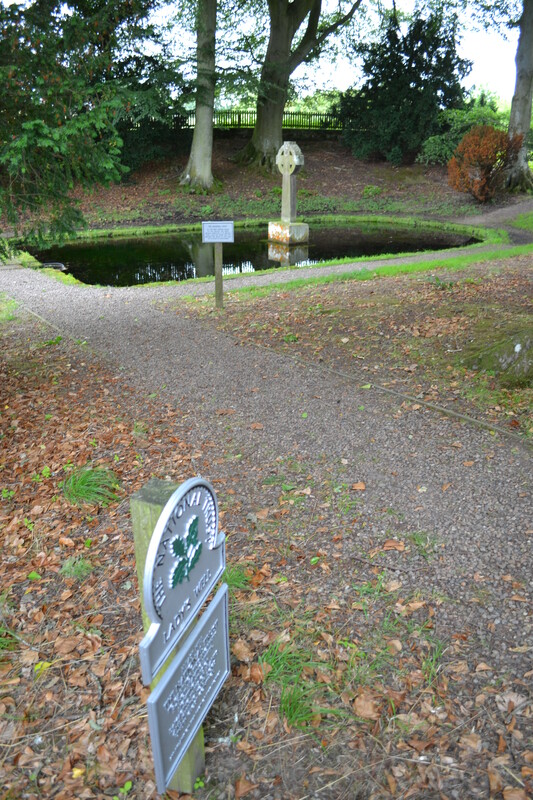 The well is particularly visited on Beltaine, the day before the 1st of May and traditionally children were left over night to cure them much like Madron’s Well. This distribution would suggest an association with our Celtic heritage, although that perhaps is not strengthened by the Lincolnshire sites. Another theory is that it may have been a tradition associated with the Gypsy community and certainly Lincolnshire, Yorkshire and the West Country are certainly traditional grounds. However, this does not explain the absence from areas such as the New Forest in Hampshire. 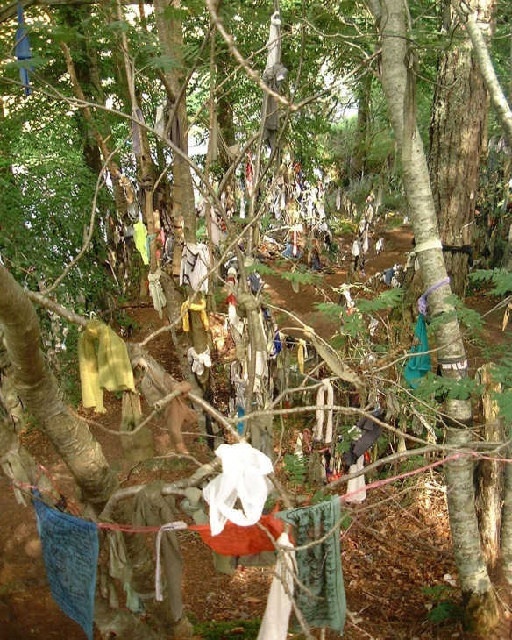 The placing of clooties is linked to Patronal days or the Christianised pagan Gaelic-Celtic feast days: Imbolc (1st February), Beltane (1st May), Lughnasadh (1st August) and Samhain (1st November). It is possibly that the clootie was an offering to a deity at the spring. 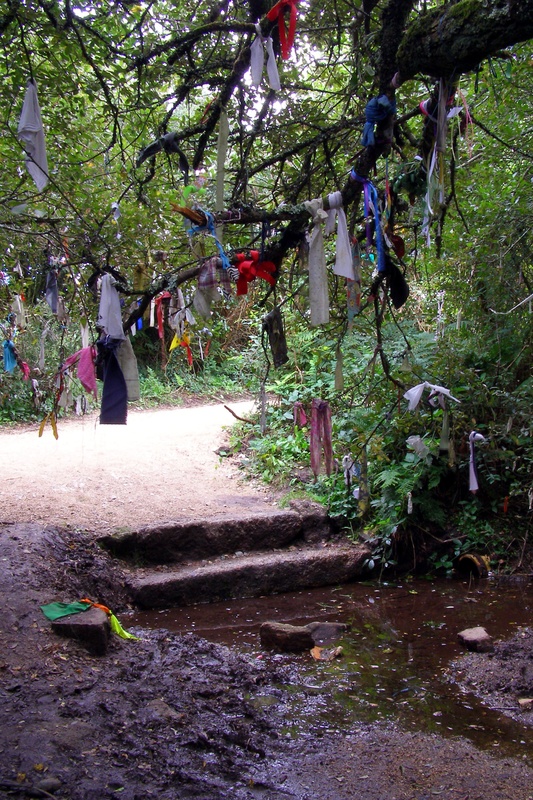 “a few coloured ribbons hang from neighbouring trees – evidently an attempt to perpetuate its memory as a rag-well”. And so it continues. Many wells and springs beyond the natural range appear to be growing in their clottie collections. A quick look on the internet even shows a few which I have done and I can still see the ribbon, sadly it wasn’t as biodegradable as I thought! How to confuse the researcher!! Jesmond Dene has seen many faces: private estate, heart of industry and delightful municipal park. Fortunately, it is the later which describes it now: a pleasant sweep of wooded valley, with its great river meandering through it, the haunt of dog walkers, joggers, parents with pushchairs and excited children. However, cast back to long before the 1800s to which much of its present guise steams from, back to the mid medieval period and this area of Jesmond was the scene of great pilgrimage. The goal of these pilgrims was the chapel of St. Mary, once the third biggest pilgrimage site in the Kingdom. To visit it now it’s difficult to understand why, despite an eerie sense of sanctity, its size suggests little importance. But size is not everything it’s what’s inside that counts and inside this chapel was thought to be a very important relic, although exactly what remains a mystery. A street in Newcastle called Pilgrim Street is said to be connected to the shrine being where pilgrims would gather and be accommodated. A feel of its importance can be gathered by a record of 1479, a Yorkshire rector left money in his will for pilgrims to travel to the Kingdom’s great shrines St Pauls, Canterbury’s Becket shrine and the chapel at Jesmond. The Pope also gave special dispensations I believe in a Papal bull. Touching the water, confusingly it does not appear to be warm, but of course that may be different on a cold day. 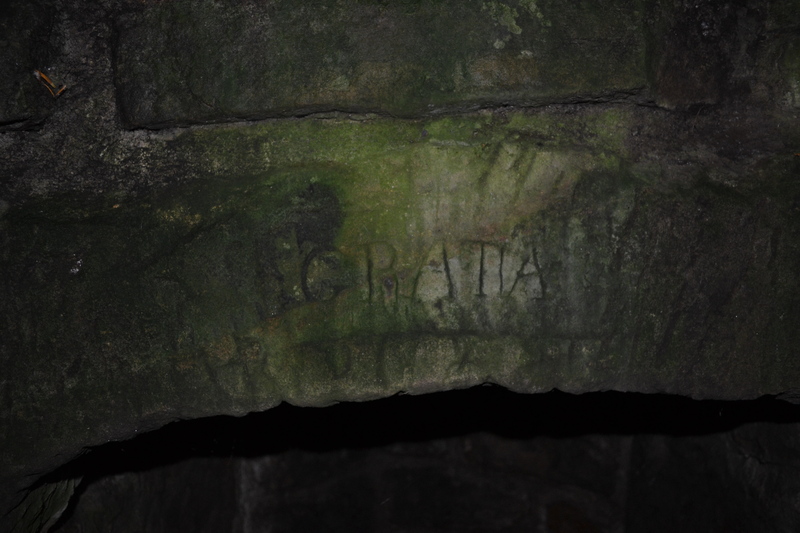 The well is arched over with an inscription stating ‘gratia’ which is said to be part of a longer inscription ‘Ave Maria gratia plena’ although the former is thought to be 18th century in date. Today the spring water is clear and flowing running over is chamber and running down the channel into an overflow albeit covered in leaves. A venerable yew shadows this secret shrine creating a quiet and somewhat eerie nook in a scene of domesticity. It still has many visitors and is kept in very good condition. On an August afternoon it can be a peaceful escape from the modern pressure of Newcastle. Water holds an innate fascination with us as a species; it is both source of essential life giving power but a still untameable force which can be unpredictable and dangerous. So it is not surprising that as well as considered to healing and holy, springs and wells have a darker side. A side I am going to explore, in a fitting post for Hallowe’en. In this overview I intend to discuss these sites, many of which only have their name to suggest this dark origin. Of these Puck or Pook Wells are the commonest, deriving from O.E pwca meaning goblin. Puck is as Shakespeare immortalises, a type of fairy. Of these there are site recorded on the Isle of Wight (Whitwell), Wiltshire (West Knowle), Essex (Waltham Holy Cross), Derbyshire (Repton), Somerset (Rode), Northamptonshire (Aynho) and Kent (Rolvenden and St. Paul’s Cray), The latter does underline the otherworldy nature of springs which despite being in an area of urbanisation. It fills a boggy hollow just off the footpath and even on a busy summer’s day you feel remote. 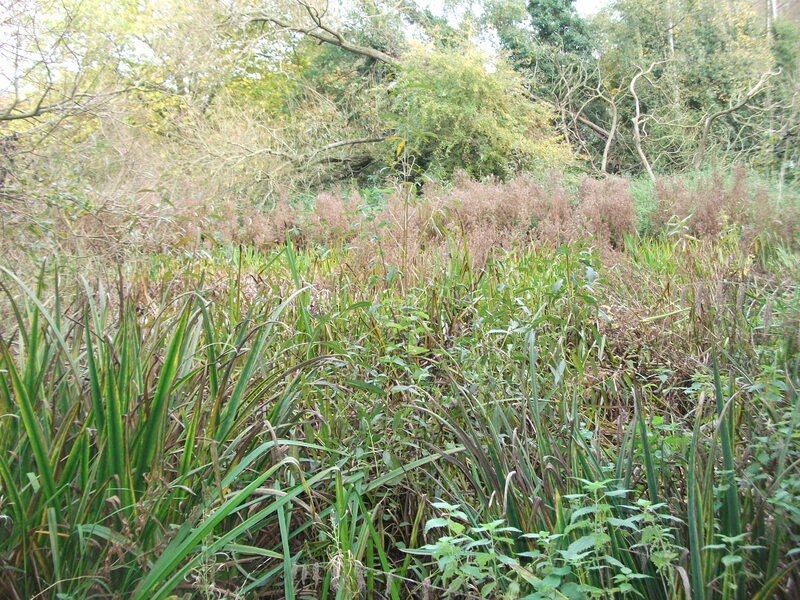 Joining the Puckwells is the more general Pisky or Pixy well (the spirit which has led the written many times astray), a term found generally in the South-west such as the site in Cornwall (Alternun) and Somerset (Allerford). One can certainly feel the presence of these folk on a visit to the former especially with is ancient mossy basin and small wellhouse. The second most common otherworldly character is Knucker, Nicker, Nikor or Nicher. This is a pagan Norse monster, which some have associated with St. Nicholas, who is said to have fought a sea monster. The most famous site is the Knucker Pit in Lyminster (West Sussex). This is associated with a notable legend which records that the dragon terrorised the countryside and took away the daughter of the King of Sussex. The king offered the hand this daughter to anyone who would kill it and a wandering knight did poison the beast and claimed her hand. The term appears to apply to sites from Kent (Westbere), Edgefield (Norfolk) and Lincoln. One wonders, whether these had similar legends. 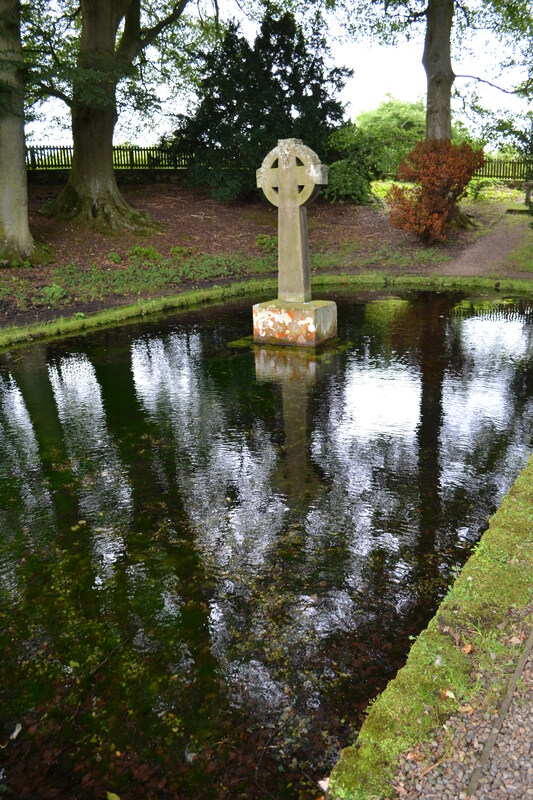 Thor is perhaps commemorated in a number of wells and springs, especially it seems in the counties were the Danish influence was greatest, the most famed of these being Thorswell at Thorskeld, near Burnstall (North Yorkshire), interestingly this is one of the areas St Wilifrid is said to have converted. Less well known are other sites can be postulated in Lincolnshire with Thirspitts (Waltham, Lincs), Threshole (Saxilby Lincs), Thuswell (Stallinborough, Lincs) and Uffington’s Thirpolwell (Lincs). The latter most certainly, a likely candidate, but of the others there may not even be evidence they are springs let alone their otherworldly origin. The O.N term Thyrs for giant may be an origin. There are a number of springs and water bodies associated with what could be considered pagan gods, but I will elaborate on these in a future post. Many spectral water figures in the country are called Jenny. Whelan (2001) notes a Jenny Brewster’s Well, Jenny Friske’s well, Jenny Bradley’s Well. 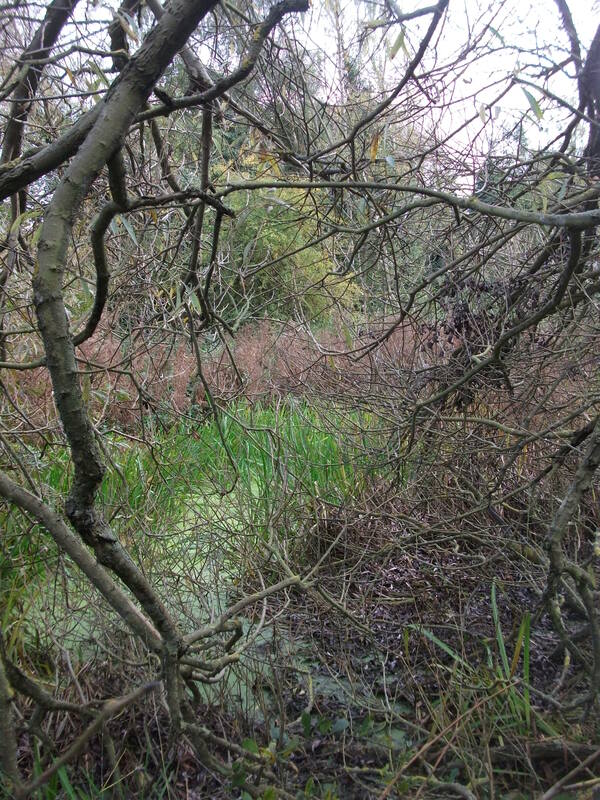 The name is frequently encountered in Lincolnshire, were a Hibbaldstow’s Stanny Well, where a woman carrying her head under her arm, called Jenny Stannywell, who once upon a time drowned herself in the water. At a bend of the Trent at Owston Ferry was haunted by Jenny Hearn or Hurn or Jenny Yonde. This little creature was like a small man or woman, though it had a face of a seal with long hair. It travelled on the water in a large pie dish. It would cross the water in a boat shaped like a pie dish, using spoons to row. One wonders whether there is a story behind Jenny’s Well near Biggin (Derbyshire). Sometimes these weird creatures were doglike like that said to frequent Bonny Well in Lincolnshire. 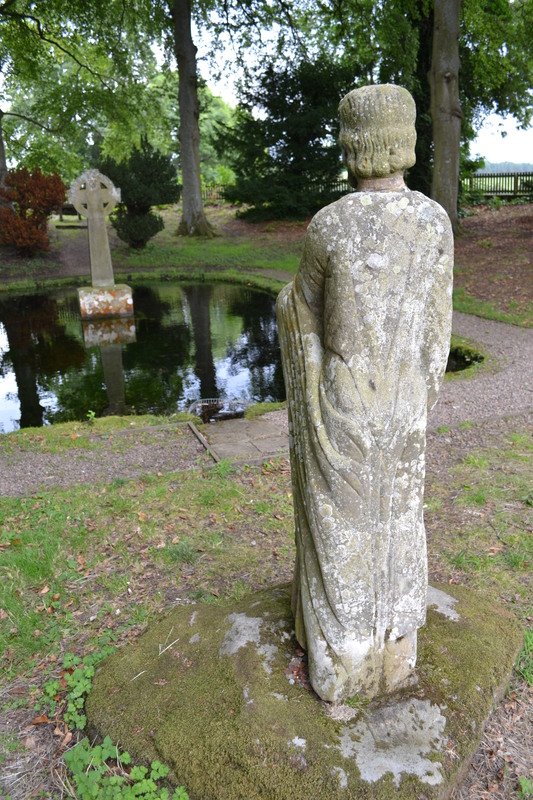 Many of these creatures such as the one eyed women from Atwick’s Holy well span the real and the otherworldly. When discussing the spirit world, by far the commonest otherworldy being associated with wells. Ghosts are also associated with springs. 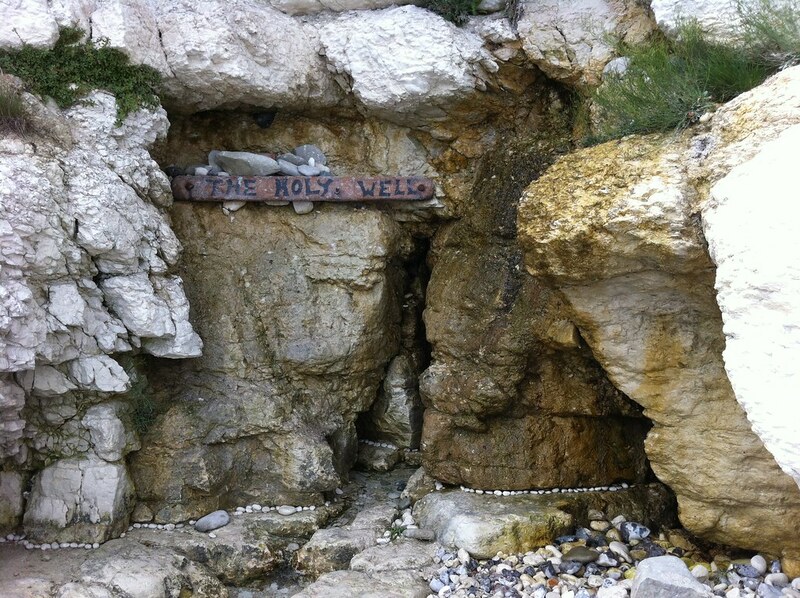 Sometimes they are saintly, such as St Osyth (Essex), but often if not a saint, they are female such as a pool in Chislehurst caves, Lady’s Well, Whittingham (Northumberland), Lady well, Ashdon (Essex), White Lady’s Spring, (Derbyshire) Peg of Nells Well , Waddow (Lancashire) Marian’s Well Uttoxeter (Staffordshire), Julian’s Well, Wellow (Somerset), Agnes’s Well Whitestaunton (Somerset), a Chalybeate spring in Cranbrook (Kent) and so the list goes on and is a suitable discussion point for a longer future post. All that can be said is that the female spirits outweigh the male ones and this must be significant. To end with, that staple of Hallowe’en, the witch, is sometimes associated with springs, especially in Wales. This associated perhaps reflects their ‘pagan origins’ or else there procurement post-Reformation, afterall it was thought that they stole sacred water from fonts, so it is freely flowing elsewhere why make the effort! The most famous of these being Somerset’s Witches Well (Pardlestone) this was said to have been avoided by locals until it a local wise man three salt over the well and removed their presence. So there was a rather brief and perhaps incomplete exploration of the unlikely combination between holy wells and the darker aspects. In a future post I will explore the associations with ghosts and in another on supposed evidence of pre-Christian gods and goddesses at wells. Perhaps Hobwell’s name was a way to discourage visitors…it looks pretty eerie even now! Much has been written regarding holy wells culminating in Harte (2008) magnus opus but no survey has attempted to record all those wells and springs named after monarchs as far as I am aware. With Jubilee fever all around I thought it would be fitting to start an overview of this aspect of water lore in England. Starting with King well, a generic name, is by far the commonest with sites recorded at Chalk (Kent), Cuffley (Hertfordshire) (although associated with James I), Chigwell (Essex) (although probably cicca’s well)), Lower Slaughter (Gloucestershire), Kingsthorpe (Northamptonshire), Orton (Northumberland), Cheltenham (Gloucestershire), Ellerton (Staffordshire), Wartling (Sussex), and Bath (Somerset). Some of these such as Chigwell may be a etymological mistake being more likely derive from Cicca’s well and some such as Orton are thought to be associated with Iron age sites. 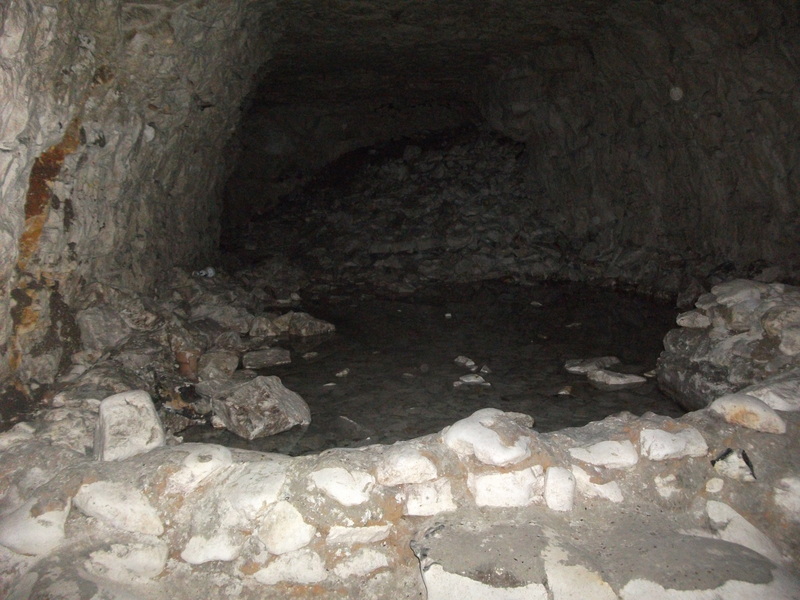 However, English wells and their associations with monarchs starts perhaps starts with King Arthur’s Well (Cadbury ) but taking this probably mythical king aside, and not considering those monarchs associated with the Celtic and Saxon Kingdoms (after all a high percentage of these early saints were the sons of Kings (such as those begat by King Brechan) or early kingly Christian converts for example St Oswald or St Ethelbert ) which are better known by their sanctity rather than their majesty, I start with sites associated with who is seen as being the first King of England; Alfred. I can find no wells associated with the Norman Kings or Queens and the next monarch to appear is King John. He is interestingly the monarch with most sites associated with him, being in Heaton Park (Newcastle), Odell (Bedfordshire), Kineton (Warwickshire) and Calverton (Nottinghamshire) (although the later is recorded as Keenwell). This may be the consequence of his infamy and association with Robin Hood sites taking on his name in the telling and re-telling of Robin Hood tales. However, in most cases it would appear to be sites associated with a castle although surely King John was not the only monarch to have used such sites. The next monarch associated with a well is a prince, a man who despite being heir apparent, never reached the throne. The Black Prince, a very romantic figure and with an evocative name, his spring is perhaps the most well known of those associated with royalty: the Black Prince’s Well, Harbledown (Kent). Legend has it that he regularly drank from the well and asked for a draught of it as he lay sick and dying of syphilis. However, the water’s powers did not extend to this and he died never becoming king. The well has the three feathers, sign of the Prince of Wales, an emblem captured at Crecy although the origin and age of the well is unknown it is the only such spring with any insignia of a monarch. The subsequent centuries saw a number of squirmishes and conflicts which also created some springs associated with royalty. Perhaps the most interesting well associated with a monarch is King Henry VI’s Well, Bolton in Craven (North Yorkshire). It is interesting because the King’s reputation was that of sanctity and as such any well would have pretentions to be a holy well. Indeed the local legend states that when a fugitive at Bolton Hall he asked for the owner to provide a bathing place. No spring was available and one was divined with hazel rods and where they indicated water the site was dug. The king prayed that the well may flow forever and the family may never become extinct. The site still exists and is used for a local mineral water firm! 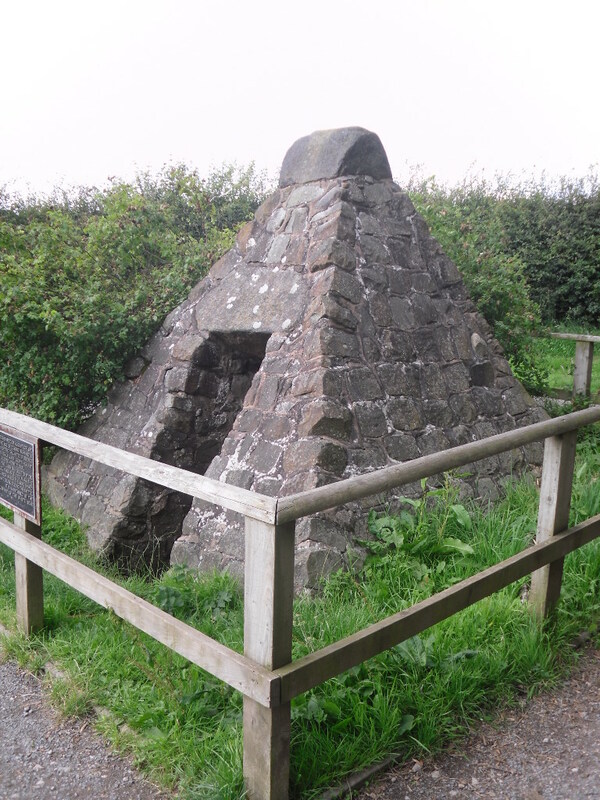 The years of conflict between the Lancastrians and Yorkists ended at Bosworth field and here a we find King Richard’s Well, Sutton Cheney (Leicestershire). Traditionally Richard III drank from a spring that Lord Wentworth in 1813 encapsulated in large conical cairn shaped well house with an appropriate Latin inscription. Curiously both wells of course mark the losers of the battle and no wells record the victors of such conflicts. One wonders whether this records our interest in the underdog and lament for the lost. The strangest extrapolation of this is a well found in Eastwell (Kent). 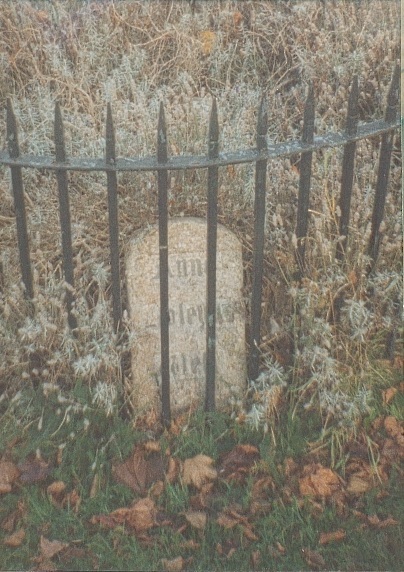 Here generations have pointed to a circular brick well in the estate grounds and a tomb in the derelict church and associated them with the lost son of Richard III. The Plantagenet’s Well may indeed have some basis in fact although the only evidence is the account of the legend during the building of Eastwell Manor in 1545, the landowner, Sir Thomas Moyle, was amazed to find one of his workman reading a book in Latin. Naturally curious, he decided to ask him about this ability. Thus the man informed him, that in 1485, at Bosworth Field, he was the illegitimate son of King Richard III, who had previously clandestinely acknowledged him as sole heir. The following day, fearing reprisals after Richard’s loss, the boy fled, avoiding being recognition by disguising himself as a bricklayer and thus was years later, employed in the manor’s construction. Sir Thomas, believed the man’s story, and being a Yorkist sympathiser, adopted him into his household. This story of Richard Plantagenet remained a family secret, until it was revealed in Gentleman’s Magazine, as a quotation from a letter written by Thomas Brett, of Spring Grove (near Eastwell) to a friend Dr. Warren. He had heard the story from the Earl of Winchelsea at Eastwell House about 1720. This story is further enforced by Parish records showing that on December 27th 1550 V Rychard Plantagenet was interred, the notation V being a notification for a royal personage. However, having never seen the record myself I am unsure of its validity. The next monarch encountered in a well dedication is a surprising one perhaps. In Carshalton (Surrey), we find Anne Boleyn’s Well, which is an perplexing dedication considering her unpopularity and association with a monarch who would have seen holy wells another trapping of the papist money making machine he had excluded from his realm (although there is little evidence that Henry VIIIth had any real direct effect on holy wells as would the newly established Scottish Kirk). The legend of its formation related that when the King and Queen were out riding from Nonsuch Palace, her horse’s foot hit the ground and a spring arose. No reason for is given and it is probable that the spring was re-discovered and perhaps dedicated to St. Anne. Bedford’s Park is not far from Pygro’s Park which has an association with Henry VIII so one assumes the Queen Anne’s well is again Boleyn although I know nothing more and indeed missed it from my survey! Perhaps in the day when the site of the monarch was an extremely rare occasion folk memory has preserved it. This may explain King James Well Mickley (Yorkshire) whose only reason for the dedication was that he stopped to drink at it! This well does not appear to have then developed any note as a consequence. 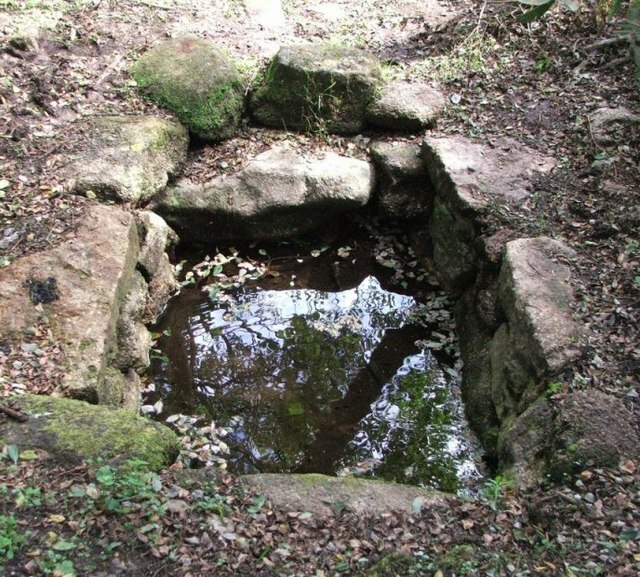 However, a spring at Cuffley (Hertfordshire) was visited by the King and developed into a minor spa called the King’s Well. Interestingly, if England had not broken from Rome we may have seen those associated with Charles I develop in the same fashion, after all he does have churches and chapels named after him. Charles is often associated with wells, in some cases such as Carles Trough, (Leicestershire) where he is said to have watered horse here after Naseby. 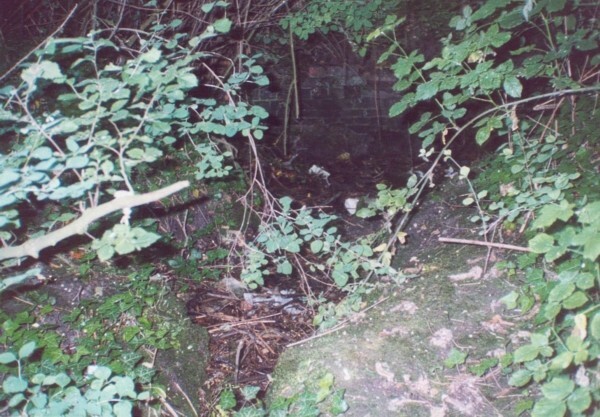 Ellerton’s (Staffordshire) King’s Well and Longhope (Gloucestershire) Royal Spring are both associated with the monarch. An accompanying woodcut to the piece showing the stone with the royal monogram carved in the centre. In 1698 Anne of Denmark gave money to create a basin at Tunbridge wells and well was called the Queen’s well. Of course in the next two centuries, the rise of the spas saw many mineral springs develop the patronage of the monarch such as George IV, yet despite this times had changed and the wells did not take the monarch’s name directly. By the reign of Victoria, her name was then applied to fountainheads and pumps, as old wells were filled in and channelled away amidst growing concerns for the need for clean and freely accessible water. A few sites such as the confusing named Coronation or Jubilee Well (so marked on the 1844 OS map so difficult to record which monarch and which jubilee or coronation is referred to) in Wessington (Derbyshire) buck the trend. In summary it is interesting that despite a large number of memorable and in some case not so memorable monarchs, there is are a limited number of them associated with wells. Why? Is it due to these particular monarchs having pricked the public’s folk memory, or in some cases inherited some sort of pious notion akin to that associated with holy wells. a) Those drunk before a battle or whilst on the run from a battle. This could include the Battle Well Evesham (Worcestershire), with its associations with Simon de Montford is out of the scope of this blog but shows this trend, the water becoming curative. b) Those associated with their castles, palaces, hunting lodges. But why these particular monarchs is unclear? c) Those made by miraculous events such as that associated King Henry VIs well. It seems perhaps these sites had developed in anticipation of the eventual sanctifying of the individuals which of course never happened.